We're all about creativity when it comes to custom wallpaper projects. Even though we're chocked full of original ideas, imaginative kids can always give us a run for our money. We always hear that our custom wall mural installations inspire their viewers, so placing a mural in your kids' arts and crafts room will certainly aid in the inspiration of your children in their art projects. Before we continue, the first concern of parents is the durability of the wallpaper, as well as if the mural can be cleaned. We print our custom wallpaper with inks that are waterproof, and may be cleaned with mild, non-solvent cleansers. Avoid abrasive scrubbers or pads in favor of soft cloths to ensure that the wallpaper will not be scratched. Of course, if the mural is drawn on with permanent markers, this will not be able to be easily removed. At the end of the day though, wallpaper isn't bulletproof, and our custom wallpaper follows suit. We like the mural image as shown above as it focuses on the central theme of the arts and craft room: art supplies. The colored pencils' repetition offers visual interest compositionally, while the bright colors will engage your child's interest and surely spur them on to new heights of creativity. 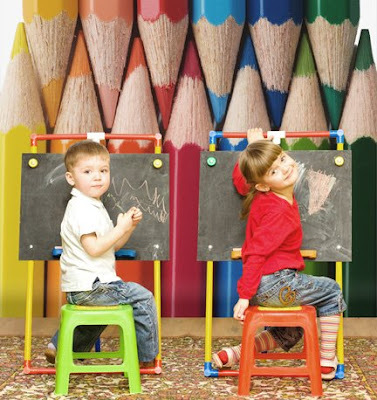 A custom wall mural in the arts and crafts room is not only great for the kids, but can be engaging for Mom and Dad during scrap booking projects, while gift wrapping, or whatever activities you undertake with a craft table. Contact us to learn more! This is a fantastic idea, my kids would love their own custom mural. Great fun!